Welcome to the scandalous misadventures of scurrilous boozer and malcontent, Hiram Grange. Though afflicted with a laundry list of dysfunctions, addictions and odd predilections, Hiram Grange stands toe to toe (and sometimes toe to tentacle) with the black-hearted denizens of the Abyss and dispenses justice with the help of his antiquated Webley revolver and Pritchard bayonet. A five-part series. Cover and illustrations by Malcolm McClinton, and original woodcut prints by Danny Evarts. Available at Amazon, Barnes and Noble, BooksAMillion, and AbeBooks. The series is available in a five-book set: Hiram Grange Volume 1 (5 book Set). 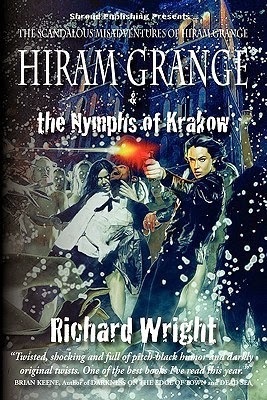 Shroud Publishing is pleased to announce the publication of Hiram Grange & the Nymphs of Krakow, the fifth and final novella in Volume One of the Scandalous Misadventures of Hiram Grange. Second favorite book in the series - and it's second only because it follows my first favorite installment of Hiram Grange's misadventures. This series keeps getting better. The lucidity introduced in Kevin Lucia's fourth installment continues here, with Hiram's drug-use remaining by the wayside and a possible explanation for some of his issues with drugs, given what we learn about his boss (no spoilers). Again, old myths are cleverly used to create antagonists and one of the horror scenes was ripped straight out of what we're told is a common sexual fantasy that men are said to possess - I love how the author took a supposed fantasy and twisted it all up. I've mentioned this before in reviews of the previous novellas but it's worth repeating - I love that we get a new author with each installment because the continuously changing perspective prevents the storytelling from becoming monotonous. I do hope we see the same authors in a second volume of misadventures. And there's tons of set-up for a second volume but no word on its progress. I want to know what happens to Hiram Grange.